"I never asked for anything! Maybe that's the problem!" That's an amazing quote from Rooney Mara in Carol, one of the year's best films. The film is based on the book The Price of Salt by Patricia Highsmith. Mara portrays Therese Belivet, a 20-something department store worker in 1950's Manhattan, who notices an older woman in the store. The woman is Carol Aird (played by Cate Blanchett), a glamorous woman in her early 40's. 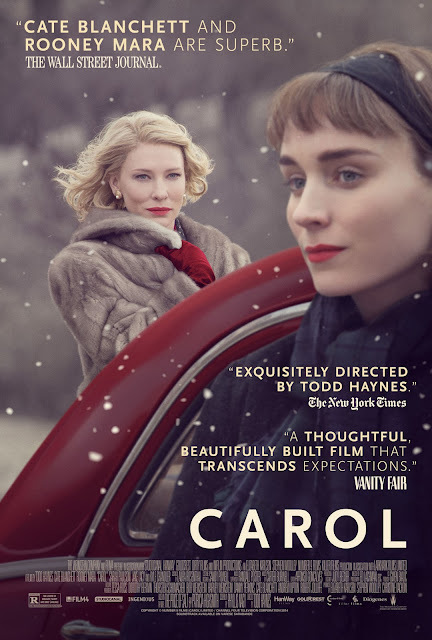 Based on Therese's recommendation, Carol buys a train set as a Christmas present for her daughter, Rindy; however, Carol accidentally leaves her gloves at the counter. Therese takes the gloves home with her & sends them to Carol, using the sales slip to find Carol's address. Therese has a boyfriend named Richard (played by Jake Lacy) who wants to go with her to France so he can marry her, but Therese is ambivalent about their relationship. Their mutual friend, Dannie (played by John Magaro), invites Therese to the offices of The New York Times, where he works, & then kisses her. Meanwhile, Carol is in the midst of a divorce with her husband, Harge (played by Kyle Chandler), & they are fighting for custody of Rindy. Harge is suspicious of Carol & Therese's relationship, considering that Carol had an affair a while before with her friend, Abby Gerhard (played by Sarah Paulson). Harge then decides to take Rindy with him to Florida for Christmas. After a while, Carol & Therese's friendship strengthens, & they eventually acknowledge their feeling towards one another. However, Carol is now torn, because Harge has now discovered their relationship, & is now going to try to get sole custody of Rindy, unless she ends her relationship with Therese. The film is excellent. Mara & Blanchett's performances are heart-breakingly beautiful. The direction from Todd Haynes is excellent. The screenplay from Phyllis Nagy is amazing, staying true to the book. The cinematography, film score, costume design & production design are also excellent as well. Overall, this is one of the 10 best films of the year. The fact that this film was not nominated for the Academy Award for Best Picture is extremely terrible, as it had been considered one of the year's best films. And I think this will go down as one of the biggest snubs in Oscar history.